We hope you enjoy browsing our entire selection of KT and the Squid Patterns! Ready to get your pouf on?! Designed by Katy Peterson, of KT and the Squid, Monster Pouf uses a Scheepjes Stone Washed XL - River Washed XL Colour Pack. 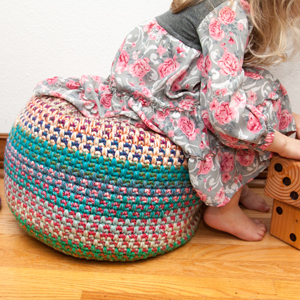 Perfect for kids, pets, or as a stylish, modern addition to your living room, you'll love this colorful pouf - no monster needed! Finished Measurements: Approx. 18" wide by 12" tall depending on how full you stuff the pouf.